Military Ballistic Industries (MBI) offers these precision reloaded rounds as a low-cost alternative for high-volume shooters! 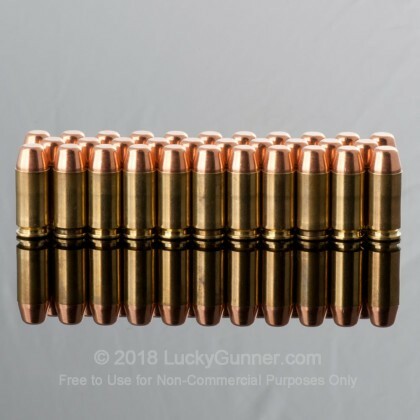 These .40 S&W cartridges are built upon once-fired brass casings which helps keep prices down so that you can get the training you need without emptying your accounts. Each case has been inspected, cleaned, and polished before receiving a non-corrosive Boxer primer from either CCI or Winchester; both companies make reputable primers that offer reliable ignition with every shot. 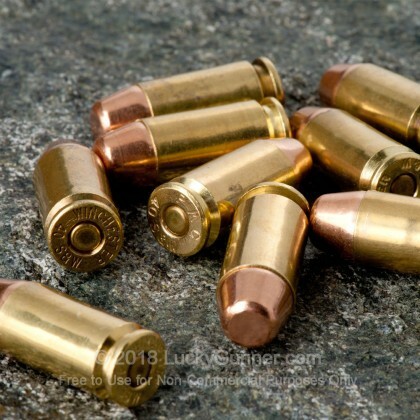 In addition, the rounds contain Hodgdon propellant and are crowned with plated bullets from Berry’s. 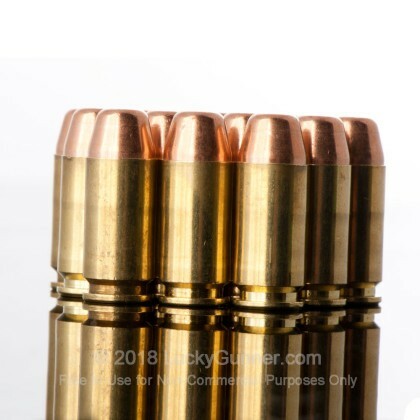 Berry’s copper plated projectiles are superior to conventional plated bullets due to their hardness which maintains shape and prevents excess fouling. This load uses a flat nose bullet that weighs in at 165 grains for relatively light recoil and laser-like trajectory. The weight is also common to the .40 caliber and will match numerous practice and defense options. I have fired 1000 rounds of this through my M&P40 without any issue. I had had a few failure to feeds on the first mag, then polished up the feed ramp, and have had zero issues since. This is definitely my go-to ammo for target practice. I have not had a chance to put the gun in a rest/vice and compare the accuracy to factory loads, but I have not seen any difference between this stuff and Winchester white box (fired 50 rounds of this, then 50 Winchester, and it seemed to do just as well). I ordered three 100 round packages, and shot all 300 rounds in one trip to the range to sight in a Crimson Trace laser on a Glock 23. Not a single issue, and despite my being a new handgun owner, my individual magazine groupings were almost all completely contained within a dinner plate-sized bullseye set of target sheets. I did have to give the gun a good cleaning afterwards. Will definitely be buying more, and I'll likely buy 1000 round bulk going forward. I've fired over 1000 rounds thru my Glock 23. Only 1 misfire. I did not have a single jam or stovepipe. It's not pretty ammo but for the price, you can't beat it for target practice. Great ammo will buy again. Good Ammo, good price. No problems with it in a S&W 4046. The MBI 165 and 180 grain bulk packs are the way to go for me as I spend a few hours every week shooting. Never a Had a bad bullet and have gone through many bags of ammo. I bought this 100 round pack of MBI .40 S&W so I could test it and see if it was worth picking up more to practice with. Once I placed my order, I received it quickly. Upon receiving, I looked over every round and found 9 rounds with dented cases, and one round that possibly had a tiny hole in the case. I put these aside and haven't shot them yet. The other 90 rounds looked good. I noticed that I had about 12 different head stamps total throughout the bag. Looks aside, the ammo performed well. Out of what I shot, I only had one failure to feed, remedied by slapping the slide of my XD40 into battery. I was in the middle of some defensive pistol training and didn't take the time to really check the issue, but did notice it was one of the nickle cased rounds( it was either a Speer or Winchester case in this instance). Overall, every round loaded in my gun fired so its good ammo as far as I'm concerned. I didn't do any accuracy testing, but I was able to put my shots where I wanted them. I personally wouldn't reload the cases from this ammo just because its already been reloaded at least once. I will probably buy more of this ammo strictly for range use and will pass it on as an affordable option to my friends but will urge them to check every round for any defects. Super target ammo. 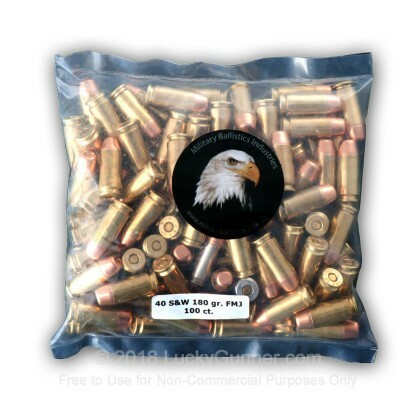 I hve purchased bulk from Lucky for my Bersa 380. This purchase for my CZ 75 .40 cal is great as well. No misfires or FTE. Just a great buy. Good service. Quick shipping. No issues with my Glock 35. Great prices, great service and fast delivery. Ran 100 rds. thru My Beretta .40 Mini-Cougar without ANY hickups. Never a failure with the ammo and my Berretta cougars shoots it very well. Ammo arrived before I expected it. Great service. Haven't had a chance to fire yet, but rounds were like new. One plastic package had split open, but otherwise, the packaging was in good shape. This ammo performed really badly for me but I'm not sure it is entirely the fault of the ammo. I used it in a brand new (never fired) Walther P99. Maybe that gun is fussy or maybe it just needs to be worn in. The first 3 or 4 rounds, of every mag, jammed. The rest of the mag always fired perfectly which suggests it could be the mag spring or something else not related to the ammo. 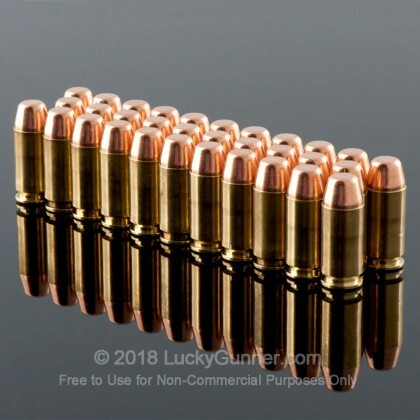 this is affordable ammo, and looks decent. but it constantly jams in my sig. where the brass seats the bullet there is a lip that catches and causes it to jam. if you dont mind clearing your gun this is ok, no missfires just alot of jams. i wouldn't use it for carry ammo. Very pleased with this product and customer service at Lucky Gunner. Fast shipping, rounds feed well. Value is good. this ammo was a fantastic value. i fired about 150 rounds through my m&p 40 without a single issue and very little cleaning was needed after. my order arrived within 5 days and that included the weekend. customer service was fantastic!!! i will be customer for a long time to come. 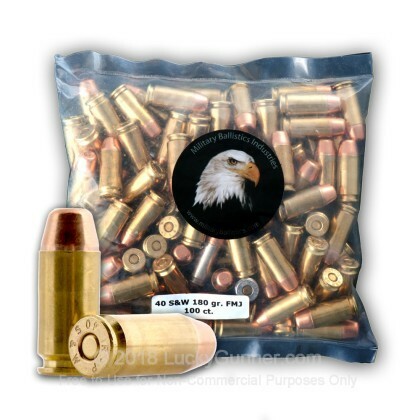 This ammo is amazing for the price!! Normally I shoot 180 gr. 40 cal through my Glock 22, but this 165 gr. runs great too. The ammo is a little dirty, but nothing worse than Remington UMC. I was also very pleased with how accurate this stuff shoots, and I will be buying 1000 rounds of it soon. I had no malfunctions or any other problems out of the 100 rounds in the pack that I got, and every round looked like it was brand new. Bottom line, buy this stuff if you are looking for very good quality range ammo at an incredible price. Great product, will definitely buy again. Was blown away by how fast it was shipped to me. Ordered it after hours on a Tuesday night and it arrived to my doorstep on Thursday afternoon! Not one misfire or jam. Product was clean and ready to fire. Before I knew it, the bag (of 100) was almost gone. Clean burning, little gun cleaning needed after 80 rounds. 80/80 loaded, fired without issue. No jams or misfires. Ordered 3000 rounds in my first visit to this site! Plan on ordering much more from this site going forward as Luckygunner.com processed and ship my order with zero snags! Was pleased with the deal super fast shipping was able to fill all 6 of my mags and had plenty extra left over to boast. Gonna buy more when I don't have the wife supervising my purchases. Get it before it's all gone! Great price and works well in my new S&W M&P .40. Can't beat the prices and I love that super FAST shipping. My father found this ammo and purchased it for his 9mm, naturally I couldn't believe the price when I saw it in .40. 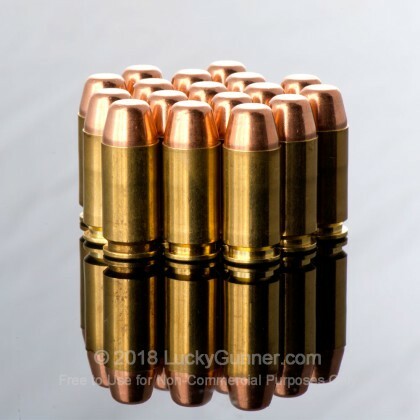 I took all 100 rounds to the local range and was so pleased with this ammunition that I have already purchased the 1000 round bulk from this site. Not a single misfire or jam. Let me also add that Luckygunner.com was very fast in processing my order, not to mention that I had my product within 3 days time. Outstanding job!! !